Rising sea levels, changes in marine habitat, decreasing Arctic sea ice and retreating mountain glaciers over the last 50 years all signal that the planet has long surpassed a tipping point in a changing global climate. Now, a new report said 2015 was the warmest year on record for the Earth. The latest State of the Climate report said climate change and one of the strongest El Niño events in recent history are responsible for warmer conditions around the world. Temperatures in 2015 were 0.1 degree Celsius above the record set in 2014. They are now a full degree Celsius or 1.8 degrees Fahrenheit above the mid-19th century pre-industrial average. The report was produced by the National Oceanic and Atmospheric Administration’s National Centers for Environmental Information and published in this month’s Bulletin of the American Meteorological Society. Thoman was not one of the 450 co-authors of this year’s State of the Climate report, although he routinely works with his colleagues at N-C-E-I. For just Alaska, 2015 was the second warmest year ever, right behind the record set in 2014. Warm sea surface temperatures in the Gulf of Alaska and the Bering Sea were likely the cause of warmer than average conditions in Alaska over the last three years. The decline in Arctic sea ice also means more moisture is being pulled up into the atmosphere. Thoman said that can affect inland areas as well as the coast. Scientists expect the equatorial Pacific will cool this year. The developing La Nina is a reverse of the super strong El Niño that recently fizzled out. That may mean cooler conditions for the next year or so, but Thoman said don’t expect the long-term trend to ever reverse. The State of the Climate report noted that atmospheric concentrations of greenhouse gases set a new record. The average levels of carbon dioxide, methane and nitrous oxide rose to just over 400 parts per million (ppm) for the first time ever. Among the other highlights, sea surface temperatures and average overall ocean heat content in 2015 surpassed 2014’s record. Sea levels are also the highest on record, or about 2.75 inches above the 1993 average. Some parts of the globe experienced an above-normal rainy season, partly because of the strong El Nino. But, overall, more areas around the globe experienced a severe drought. How has the Earth been affected by warmer temperatures? According to the State of the Climate report, the number of tropical cyclones was well above the average with most of the activity in the Pacific. The Atlantic was fairly quiet in 2015. Sea ice remains low as the Arctic continues to warm at a faster rate than the mid-latitudes or the tropics. Arctic fish species are being pushed out of their usual areas as warm-water species move in. Mammals such as walrus are forced to haul out on land instead of sea ice. Algal blooms have affected marine life and coastal resources all along the northeast Pacific. 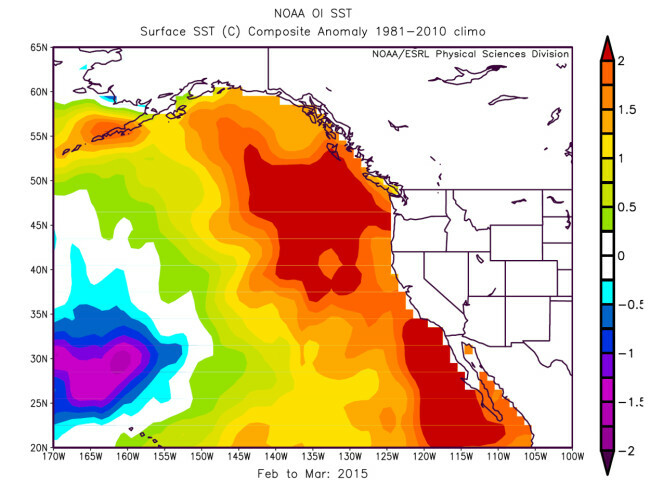 Warm ocean conditions may be a factor in the severity and early onset of the blooms. Glaciers continue to retreat for the 36th consecutive year while record high temperatures have been measured at permafrost observatories in Alaska.